Click on the town name below for individual information. The red dots on the map above represent Long Oil Company stations and bulk plants. Click on any red dot for more detailed information. 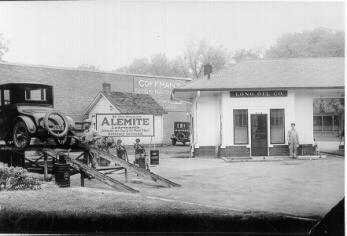 Lawrence, Kansas bulk plant. Courtesy Kansas State Historical Society. Southwest corner of 5th and Poyntz, Manhattan, Kansas. Courtesy Riley County Historical Society. � Copyright Ben Eckart. All rights reserved.